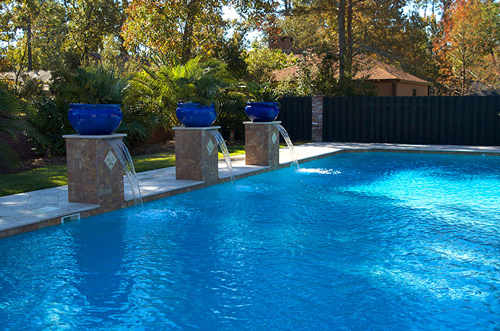 Do you own a pool that is lacking in landscaping? Do you have a table and chairs or maybe a lounger or two. Is the one thing missing is some potted plants, trees or sweet smelling flowers? Here are few tips that may help you make some decisions. 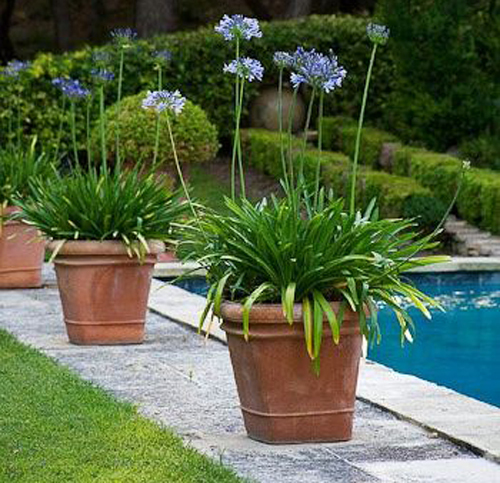 When it comes to most pool decks flowers or potted plants are some of the last items to add. Yet they shouldn't be. They add so much for a minimal expense. Fragrance from flowers, fruit trees or bushes, color from bold green evergreens, or a rainbow of color from blooming plants and flowers. If you organize it right by following a few of these tips you will add so much warmth to the deck, softness to the view and a lovely frame for the pool itself. Needing more privacy? Add tall potted trees or plants on the side you want to block. Space large planters evenly and fill with trees that will have height and width. Just make sure the planters are large enough so that you don't have to re-pot every year. We like the look of tall grasses. They add interest and are perfect for blocking areas behind them. Place some large colorful garden planters around the deck next to a table and chairs. Plant with sweet smelling flowers so that you can enjoy the fragrance. Add some trailing ivy or vinca to the edge of the planter so that you have some green falling over the sides that will add some depth to the design. 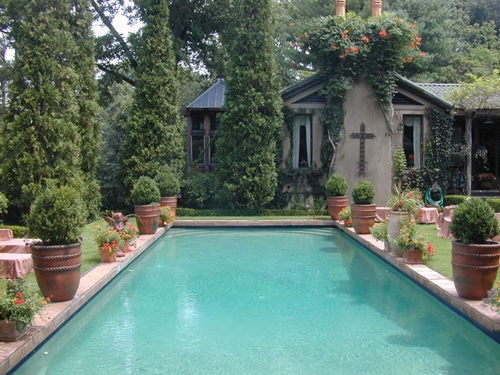 Make sure the flowers are one's you can control and they won't be dropping petals all over the pool. We also like to see potted plants that will repel mosquitoes. Obviously this will help when sitting outside after sunset. 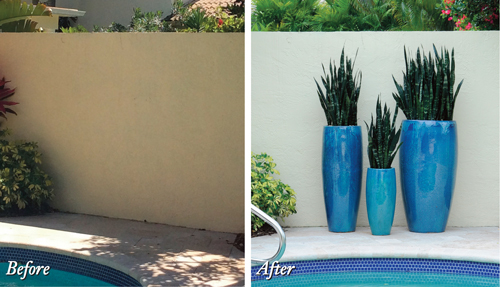 Adding a layer of color to the pool will really compliment the trees & plants you may add. If you decide you don't want anything that blooms and drops petals then use colorful glazed planters and fill with succulents, cactus, grasses and evergreens. That way you will have lots of color but no debris issues. Lastly, make sure you don't pot a type of plant that will drop debris that could stain a deck, clog a pool drain, attract bees or has thorns that kids could come in contact with. Nothing is worse than creating a bigger mess than if you just left the deck bare. So choose wisely, get creative and have fun. Having a beautiful landscaped pool deck or area is only a few tips away!